Although, Solar Power has a lot going for it, most people don’t realise they need structurally strong Roof Tiles, or Metal Roofing to mount the cells on. All the recent controversy surrounding hikes in gas and electricity prices, only makes us more determined to give alternate sources of power a try. However, older, worn and damaged Roof Tiles, or Metal Roofing might not be able to carry even the lightest Solar Power cells. Clean Solar Power is a good choice in many ways. New fashioned hot water systems take advantage of the recent advances in solar technology and efficiency. As the solar revolution takes hold all over the world, a solar hot water system is cheaper than it ever has been. No longer will you groan every time you open your power bill. A Solar Power system also has the added bonus of having a much smaller emissions impact than either coal fired electricity or gas fuelled hot water systems. It is strongly suggested you consider having older Roof Tiles, or Metal Roofing either restored, or fully replaced before you have any Solar Power system mounted. No matter which Solar Power system you select, either panels or heat pipes, are usually placed on the part of your property which can take advantage of the longest exposure of sunlight. Obviously, this is usually the roof. Solar fixings (the part that makes sure your panels or pipes aren’t going to be blown into your next-door neighbour’s yard during the next storm) often have to be drilled and bolted into the studs that hold either the Roof Tiles, or Metal Roofing. 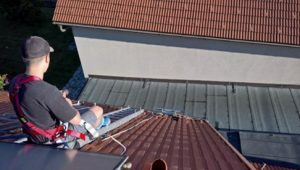 Unfortunately, even the most careful and professional Solar Power installer is going to break or damage any Roof Tiles, or Metal Roofing that has become brittle or damaged over time. Any Solar Power cells or pipes, which have been installed on faulty or degraded roofs, will most likely need to be reinstalled if that roof needs to be replaced or restored. To save time and future expense, the integrity of your property’s roof should be assessed before you contact a Solar Power system supplier. Evaluating your Metal Roofing, or Roof Tiles, strength is not massively difficult. However, climbing up a ladder and over roofing materials without causing more damage can be difficult and dangerous. We recommend inspections should only be carried out by experienced roofing specialists. Long-term roofing companies should be more than happy to discuss whether your property’s roof requires an inspection. After you’ve spoken to a roofing company and it’s decided the Roof Tiles, or Metal Roofing could have some serious problems, then a reputable should be prepared to carry out a free inspection of your roof and discuss whether it needs to have a roof restoration or full roof replacement.